The word tattoo comes from tahitian „tatau“ – to mark (Arp 2012). The basic technique of tattoing had been known for humanity for at least 5000 years, and till now its main principle changed a little – a color pigment is being inserted under the skin to create a certain symbol. The possible way of discovery of this technique is accidental – ancient human might have rubbed a scratch or wound on his skin with something similar to ash, in a way that after it healed ash stayed under the skin leaving a permanent mark. Whether this surmise is correct or not, the fact is that tattooing had been practiced as early as bronze age. 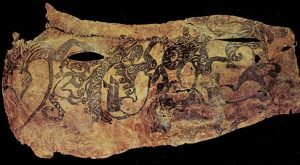 A number of archeological findings provide a more or less accurate mapping of emergence and spreading of tattooing around the globe. In Septenber 1991 a mummy of a man of bronze age was found in Otzal Alps on the border of Austria and Italy (Hewitt 1997). This became a major finding that could provide a description of the life of bronze age people – the mummy of a man that lived approximately 3300 B.C. was in perfect condition and apart from the body itself there were found numerous tools and equipment. Moreover, the body of Otzi the Iceman, as he was named after the place of discovery, was covered with 57 simple tattoos. The tattoos were in shape of dots and lines up to the length of 15 centimeters and were located on right ankle, behind left knee and on the lower spine. And though there may be made only distant assumptions about social function of these marks, their location corresponds to skin acupuncture lines, that beofre this finding were believed to originate in Asia only in 1000 B.C., which, in turn, can serve as a basis for a medical explanation of the function of Otzi’s tattoos – they could have been made to treat arthritis or other locomotor diseases (Dorfer 1999).